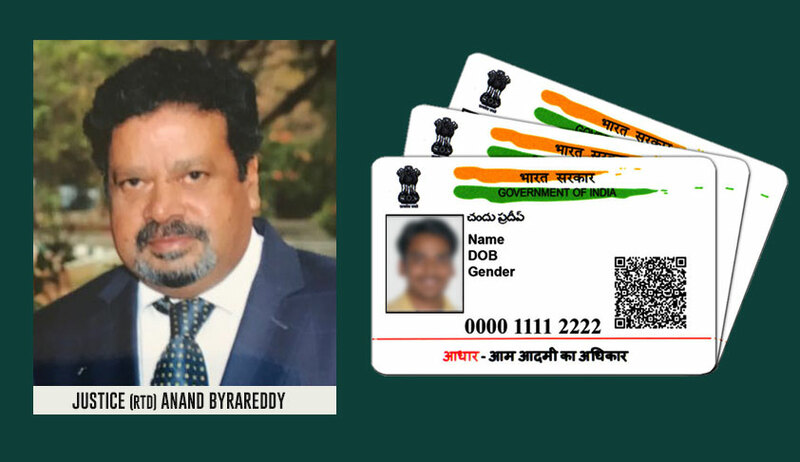 Former Karnataka High Court Judge, Justice Anand Byrareddy has filed an Impleadment Application before the Supreme Court challenging the provisions of the Aadhaar (Targeted Delivery of Financial and other Subsidies, Benefits and Services) Act, 2016. Another former Karnataka High Court Judge, Justice K Puttaswamy is the main petitioner in the original aadhaar case. Justice Byrareddy begins by highlighting the fact that the Act does not distinguish between citizens and non-citizens, alleging that this leaves the system open to abuse and poses "serious security threat". ...Therefore, given the state of the Indian economics, it is trite that without remedying the lot of its citizenry if a statutory measure seeks to impart benefits in the form of subsidies and other targeted financial aids to non-citizens the same is blatantly arbitrary and demonstrates an utter non-application of mind." The Application then goes on to allege that the Act violates the Fundamental Right of privacy of citizens, as guaranteed under Article 21 of the Constitution of India, "since biometric and demographic information is collected under the Scheme as a mandatory condition precedent, while the safeguard mechanisms provided are wholly inadequate, either in practice or in a statutory framework to ensure the security of such sensitive data". ...Furthermore, the Aadhaar Act, is violative of Article 14 of the Constitution insofar as it seeks to create a wrongful classification amongst a homogeneous group of entitled persons – (i) the ones with an Aadhaar number; and (ii) the ones without an Aadhaar number, the same is arbitrary. It is to be noted that this artificial classification also has no rational nexus to the objects of the constitutional and statutory obligations contained in the Directive Principles of the State Policy, fundamental rights chapter and statutes and programmes with respect to financial subsidies, benefits and services. Therefore, the Aadhaar Act cannot survive constitutional muster of Article 14 and is liable to be struck down in its entirety." It further points out that although the Unique Identification Authority of India (UIDAI) is in possession of the data, it has no legal liability for any theft, fraud, crime and compromise of any security or privacy. Besides, the fact that it has been made compulsory has also been impugned, pointing out that the scheme deprives people of services if they do not link them to Aadhaar. The Application, thereafter, contends that the passing of the Aadhaar Bill as a Money Bill "amounts to a fraud on the Constitution of India", and demands, "In light of the above, it is of crucial importance that this Hon’ble Court declares the Aadhaar Act to be unconstitutional on the aforestated grounds for being deeply invasive of the fundamental right of personal privacy and for the infirmities as more fully elaborated above. Consequently, the further notifications published by the Respondents are also required to be adjudicated and declared as unconstitutional for falling foul of constitutional protections guaranteed to the citizens of this country, including the Applicant herein. The menace of the Aadhaar architecture, which imperils the cherished fundamental rights of the citizenry can only be adequately protected if status quo ante is restored, i.e., the collected data of the citizens under either the Aadhaar/UID policy prior to the enactment of the statute or under the patently unconstitutional Aadhaar Act, are destroyed leaving no scope for any continuing imperilment of the rights, liberty and life of the people of this country including the Applicant."